But, some economists say that the slowdown in August could be a temporary blip, and may not be indicative of a long-term trend. China’s industrial output grew at its weakest pace in more than six year last month, partly due to the industrial shutdowns ordered by the government ahead of Olympics, the government’s statistics agency said on Friday. The sharp decline continued to be affected by the global economic downturn. Industrial production in China expanded by 12.8% in August from a year earlier, the National Statistics Bureau said after a gain of 14.7% in July. The August reading was less than the 14.5% median estimate of economists. This was slowest rate since August 2002 and well below the 17.5% recorded in August 2007. But, some economists said that the slowdown in August could be a temporary blip, and may not be indicative of a long-term trend. China’s industrial activity will pick up with the re opening of factories in Beijing and surrounding areas, JP Morgan’s local securities unit wrote in a note. Today’s weak data also increases the chance that Beijing will soon announce measures to stimulate economic activity. The figure adds to the week’s weaker inflation and trade reports in signaling that the expansion of the world’s fourth-biggest economy may keep slowing as growth falters in the US, Europe and Japan. China’s policy makers may cut the proportion of deposits that banks are required to set aside as reserves and maintain a slower pace of gains in the yuan to protect jobs, according to some economists. The reserve ratio is expected to fall 50 basis points from a record 17.5% by year’s end, dropping to 15% in 2009. The yuan fell to 6.8452 against the dollar as of 12:51 p.m. in Shanghai from 6.8449 immediately before the data was released. 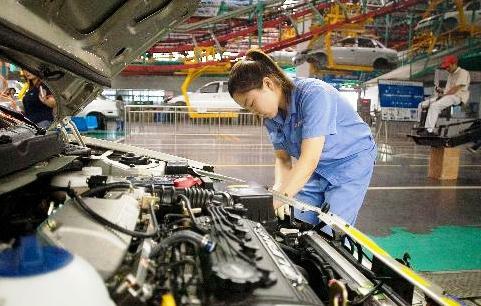 During the July to August period, China’s industrial output expanded by 15.7% from the year-earlier period. Apart from a seasonal slowdown during the Lunar New Year celebrations that fall in the January to February period, the figures represent the weakest rate of industrial output growth since August 2002. Separately, China’s retail sales grew at nearly the fastest pace in at least nine years, as rising incomes encouraged consumer spending. Retail sales rose 23.2% in August from a year earlier to 876.8bn yuan (US$128bn), the National Bureau of Statistics said today, after gaining 23.3% in July. That was more than the 23% median estimate of economists. Would production not be at it’s lowest because during the Olympics the Chinese governemnt shut down all traffic in Beijing to lower pollution levels? Wow this was doubtlessly one of the best posts I’ve had the chance to go over on the subject so far. I do not know where you learn all your information but keep it coming! I’m gunna send a few folks over here to read this. Fantastic, simply fantastic. I’m just getting into spitting out articles myself, nothing close to your writing skills (doh) but I would love for you to check out my articles sometime!